Wonderful little apartment! We will definitely come back here when we visit Zagreb again. Thank you! Great decoration!! It's really cute. We love it. We love the kitchen. We can find everything for cooking. Nice bed, we slept so well all night. Thank you so much - we had a great time! Wonderful place and location. Great last night dinner at Kaptolska. Loved the apartment, thanks. We like the location - just off the centre, easy to walk to the Main square. We liked being picked up at the airport, it was very convenient and your colleague was very helpful. This is a lovely home away from home. It is actually one of the best places we have stayed at. Very well equiped also. The bulletin board is a super idea. We will recommend to our friends that they stay at inZagreb. Perfect location - close to the churches, museums, market. Service is good and the apartmetn is very clean. It is worth of the price. I just returned from a wonderful vacation in Croatia with my two daughters and would like to thank you for our stay in the Baroque apartment in Zagreb. It was a lovely introduction to Croatia. The accommodations were comfortable and charming. The location in the historical part of the city could not have been better. Our hosts picked us up at the airport and provided us with excellent tips for sightseeing. We even had a place to park our rented car in the courtyard the night before we left. We highly recommend this beautiful apartment to other visitors. Thank you so much for your beautiful apartment! It was just perfect for 5 of us (with new 2 months old baby!). Very nice and sooo clean! Thanks to Daniela who did wonderful on our very late arrival night! We will for sure recommend! We enjoyed our stay in Zagreb and your flat very much. Thanks a lot. Please have a look at the toilet seat, a screw is missing and its getting loose (this is settled! Ivana). We have been thrilled with our apartment in Zagreb. From the warm welcome to the clean and comfortable beds! The location is fantastic, we can easily walk everywhere. 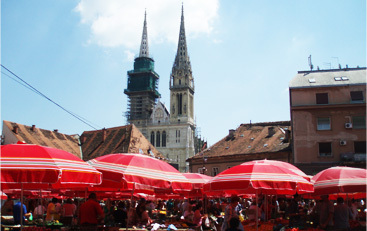 I would recommend inZagreb to anyone. Thank you. Puno Vam hvala na ugodnom smjestaju. BIlo mi je lijepo kao i uvijek. Pita od jabuka je bila fantasticna. Kad dodem iduci put, zamolit cu Vas za recept. Found out about you through Rick Steves and Lonely Planet. Baroque has been a great apartment with excellent amenities. Perfect services, location and advice upon arrival. It's been such a pleasure to stay here. Thanks. Excellent value for money. Great attention to details to ensure that guests are comfortable and have everything a home needs! Wonderfully equipped; detergent for laundry, full kitchen, great AC! Piano is our second inZagreb apartment. We are, again, very impressed with the quality of the apartments, the welcoming touches such as fresh fruit, weather report, a personal message, etc. We feel welcome and comfortable. Any questions have been quickly answered. Thank you Ivana and Ksandro - beautiful apartment. One suggestion would be to relocate the umbrella light - it interfers with getting in and out of bed (we did, says Ivana). We were very pleased with the apartment. We were warmly welcomed. The facilities were very good (laundry, shower, WiFi, etc). The apartment was comfortably decorated and we appreciated that items like disch and laundry soap were available. Hvala. We loved our stay at Downtown - the flat had all we needed and location is great! A great apartment - xxxxx stars! Great service all the way. Will come back and recommend to all our friends. Thank you that after 2 years you were able to credit us. Loved the apartment. Daniela did an excellent job of showing us the apartment and things to do in Zagreb. Wish we had more than two days to stay in Piano - absolutely wonderful. Thank you! Found you through Rick Steve's guidebook and we loved out stay in apartment Gold! Very spacious, with everything we needed. One suggestion would be to leave directions for the washing machine/dishwasher in English. Those would be helpful! Best thing all, we came to InZagreb as strangers, but went away friends. The apartment is lovely and I've had a very pleasant stay here. I'll probably be back again next year. Thank you for a nice stay, a lovely, clean and well equipped apartment. The closeness to the city centre and the tram station made our stay here really worth while. A spacious airy apartment - beautifully furnished in keeping with the Baroque style of the building. You have thought of everything to cover all needs not least your generous gifts of wine and starter provisions for which many thanks. Would certainly recommend to family and friends especially for the location. We had a wonderful stay. We enjoyed the close proximity of the apartment Piano to the city centre and the apartment itself was clean, nicely renovated and very spacious. The bed was comfortable as well which was great after a very long journey. Fantastic place to stay with fantastic service! Excellent communication leading up to visit. Lovely bus pick-up! Very clean, well-equipped, quiet! Secure! Excellent! We were very impressed by the facilities and the value. It suited our needs perfectly. Thank you very much, we will most definitely be recommending to our family and friends. Best apartment we have stayed in on this trip (Italy and Slovenia) so not much to add – except to say a very well situated and fitted out apartment. Our stay in the Orange apartment over the New Years holiday was perfect. We were happily greeted on arrival and shown the apartment. The location was close to public transport and getting to the festivities was easy. We had lots of fun and had a beautiful and warm apartment to come back to. Thanks so much! We hope to return. Croatia and inZagreb ROCKS!